Do you enjoy having brunch, at home or out with family or friends? For many of us, it’s a great time and way to eat – not too late for comforting breakfast foods, or too early for something a little more adventurous. And brunch meals of course can be as healthy as they are delicious, especially when we eat the HumanaNatura way and follow HumanaNatura’s OurPlate healthy eating guidelines. Today’s example HumanaNatura Salad Meal shows you exactly how. For today’s HumanaNatura sample meal, we begin by steaming a root base of diced white sweet potato and onion or shallot, along with a bit of crushed and finely chopped garlic and a dash of black pepper, for about four minutes in a covered saute pan (see our Cooking With Steam Overview for guidance if you are new to food steaming). When the potatoes are almost cooked, some broccoli florets, sliced red bell pepper, and baby spinach leaves are added and everything is covered and steamed for two more minutes. Once this steaming is done, the pan is uncovered, any remaining water is drained, and a splash of olive oil is added. The veggie mix is then sautéed on medium-high heat for about two minutes, two whisked eggs are added, and a folded omelet is cooked to taste. While the omelet cooks, a generous salad of arugula or other greens, halved grape tomatoes, and julienne-cut cucumber is prepared and dressed on half of a dinner plate. 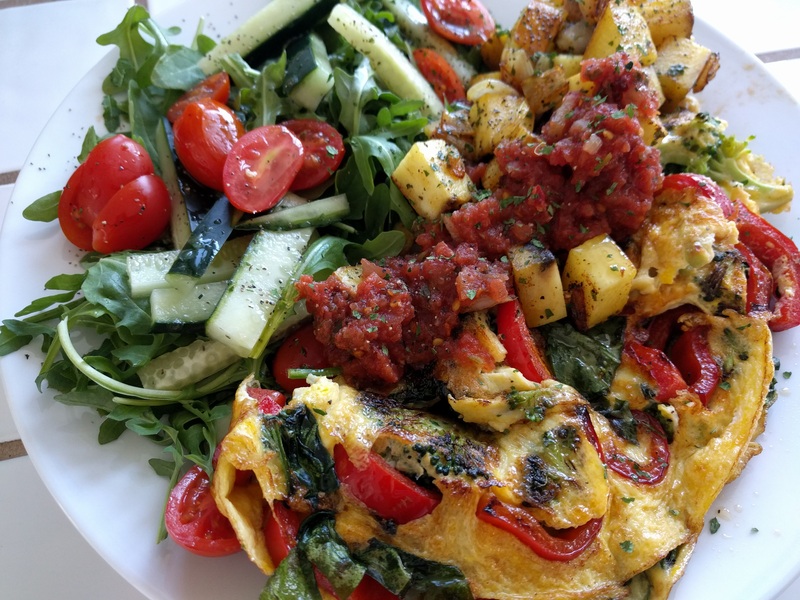 The omelette is added on the other side of the plate, along with a bit of tomato salsa, and the entire meal is garnished with black pepper and finely-chopped parsley or cilantro and served immediately. Quick, delicious, and a reminder of how good and healthy brunch can be – anytime of the day or night. 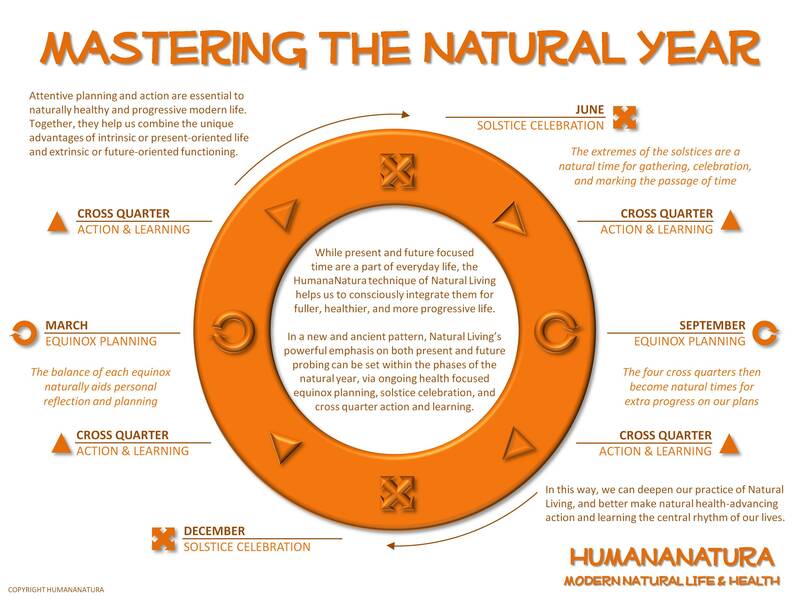 Greetings from HumanaNatura at the cross-quarter! In the natural year, we are now midway between the more evocative period of the recent solstice and the naturally more balanced time of the coming equinox. Everywhere on earth, there is clear but unmistakable change – away from the height of summer and depth of winter and toward the relative balance of fall or spring in each hemisphere – an ongoing rhythm of life on earth that touches and can aid us all.